We’d love your help. Let us know what’s wrong with this preview of Dark Child of Forever by S.K. Ryder. Fate has cast vampire Dominic Marchant and the human love of his life, Cassidy Chandler, into roles they never imagined. Thanks to his mad sire, he is now the Lord of Night, and Cassidy, with her unique ability to merge her mind w A reluctant new Lord of Night. His vulnerable human queen. If they can't change five thousand years of history now, it will change them. Forever. 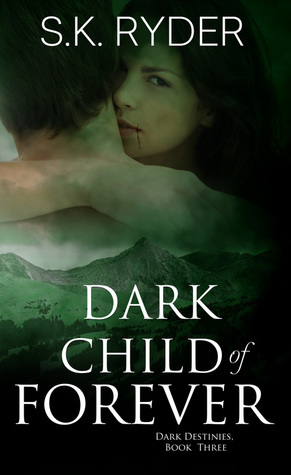 To ask other readers questions about Dark Child of Forever, please sign up. The perfect finale. The characters I fell in love with from the first book are still growing and adapting to their new destinies together. The new characters are interesting and well developed additions to the complicated weave of the storyline. I have thoroughly enjoyed this series and will eagerly await any other books by this author! As an independent reviewer for Romance Authors that Rock, I gave this one the full five hearts beating frantically. Even though there was no ugly crying involved, The perfect finale. The characters I fell in love with from the first book are still growing and adapting to their new destinies together. The new characters are interesting and well developed additions to the complicated weave of the storyline. I have thoroughly enjoyed this series and will eagerly await any other books by this author! Dominic and Cassidy are trying to move forward in their lives after Dominic became the official Lord of Night. Dominic is trying to convert a lot of dark vampires over to the good side by having them be re-sired to him. He re-sires a vampire named Aubrey who Dominic wants to go out and find bad vampires to tell them about his experience and the re-siring process. While Aubrey is away, Jackson tells the gang that there is a serum that his people made that will turn a vampire into a human again for a few hours. They’ve tested it on lab rats but not on an actual vampire yet, so they aren’t completely aware of all the side effects. Dominic and Cassidy are skeptical at first, but Dominic decides to try it. He misses his human life, like standing out in the sun, and is willing to try anything at this point. Chaos ensues however with terrible side effects that Cassidy and Jackson have no idea how to deal with. On top of all that, Aubrey runs into a gang of vampires whose leader doesn’t believe that Dominic is the Lord of Night. He tortures Aubrey for even trying to suggest that there is a stronger vampire out there then he is. Dominic has the difficult task of finding the gang and trying to convince them of who he is without anyone else getting hurt, but unfortunately it seems the gang is always one step ahead of Dominic. I loved the concept of Dominic wanting to be human again, even if it was just for a short time. I thought the idea was executed so well and made the story that much more interesting. I was so shocked by what Dominic had to go through each time he took the serum and felt so bad, but I loved where the story led to. There were some side plots going on that I didn’t feel were completely necessary but it didn’t drag the story down. Overall I really enjoyed this book and I really enjoyed this series. This is the final book in the Dark Destinies trilogy, and the author brings it home with a bang. I read the first two books in the series, and I have to say, this is my favorite, even though the other two got 5 stars from me also. But this book brings it all together – everything Dominic and Cassidy has fought for, all the answers and all the feels. Dominic and Cassidy’s bond is stronger than ever, and Dominic finally embraces his role of Lord of the Night. He comes to accept his immortality an This is the final book in the Dark Destinies trilogy, and the author brings it home with a bang. I read the first two books in the series, and I have to say, this is my favorite, even though the other two got 5 stars from me also. But this book brings it all together – everything Dominic and Cassidy has fought for, all the answers and all the feels. Dominic and Cassidy’s bond is stronger than ever, and Dominic finally embraces his role of Lord of the Night. He comes to accept his immortality and his role in the vampire world. But don’t get too comfortable, there is plenty of danger and action in this book, and it will have you on the edge of your seat. The secondary characters also grow and evolve, and the friendship between Jackson and Dominic, and even Cassidy shows that no mountain is too high to climb. Even Garrett works with Dominic on an honest level – something we never would have believed not too long ago. For vampire lovers, this is a trilogy that you need to pick up. It just gets better and better, unlike other series that start to drag, this one picks up speed as it goes. I’m sad to see it end as I’ve grown to love these characters, but the ending leaves no stone unturned and it is an honorable addition, and ending, to a fantastic series. It’s definitely going on my to-be-read-again pile. This is the third book in the series and they need to be read in order. Dominic Marchant is the Dark Lord of the Night but he must discover who murdered his friend, Aubrey Wainright, and why. Soon Dominic finds himself up against a powerful vampire named Adillo who wants to rule all of the vampires. Can Dominic along with his girlfriend Cassidy Chandler and vampire hunters Jackson and Garrett Striker defeat Adillo before he eliminates everyone Dominic cares about? This was a good conclusion to the This is the third book in the series and they need to be read in order. This was a good conclusion to the series. Dominic definitely has his work cut out for him in this book and he went through a lot this book. I was totally freaking out with what happened with the first time that Jackson tried to help him with what was developed in his lab and it didn't look good. I was thinking it was going to actually last longer than it did. I really liked the alliance between Dominic and Jackson and Garrett and how they all worked together. Cassidy was also quite tough in this book and she also went through a lot. I was super mad at what she lost this book and I wish she didn't have to lose it as I loved that idea. I liked the various alliances that were formed to bring down Adillo and his main security vampire Esteban. I was sad at what happened with Genevie and how Francesca reacted to everything and blamed Dominic. This review has been hidden because it contains spoilers. To view it, click here. What a lovely wrap-up to an exciting series! I have been reluctant to venture into vampire territory bookwise lately because I was a little fed up with the "perfect alpha vampire" and his "perfect" lover. Granted, Cassidy was a bit too much with her tolerance of some of the crazy things that happened - but I felt her pain when she realized she had lost a baby, and the chance to ever have one again. And Dominic! Loved following the angst as he pursued (somewhat rabidly at times) the idea of being What a lovely wrap-up to an exciting series! I have been reluctant to venture into vampire territory bookwise lately because I was a little fed up with the "perfect alpha vampire" and his "perfect" lover. Granted, Cassidy was a bit too much with her tolerance of some of the crazy things that happened - but I felt her pain when she realized she had lost a baby, and the chance to ever have one again. And Dominic! Loved following the angst as he pursued (somewhat rabidly at times) the idea of being able to enjoy the daytime. Jackson also redeemed himself and looked to have his own HEA by the wrap up at the end of the book. I loved this story. The writing was the high quality I’ve come to expect from S.K. Ryder. The storyline was logical and full of conflict that kept the story moving. S.K. Ryder did an excellent job of tying up the loose ends and having everyone in the series connected. My personal motto of ‘It’s a small world’, apparently even applies when the world is fictional. Great hooks kept me turning the pages to see what happened next. I’m afraid this might be the last book in the Dark Destinies series. If I loved this story. The writing was the high quality I’ve come to expect from S.K. Ryder. The storyline was logical and full of conflict that kept the story moving. I’m afraid this might be the last book in the Dark Destinies series. If so, the way Ms. Ryder completed the trilogy left me satisfied even though I’ll miss reading more about these characters. This was a great story with lots of intrigue and suspense. I would suggest that you read the first two books in the series first before reading this one. It is a different take on most vampire books and I promise you won’t be disappointed in the least. It has a very good storyline that will keep you guessing the whole way through. I loved everything about this trilogy. Adventure, action, love, revenge, comedy and different reality thrown into it with the soul bond. Excellent writing and not once did I shake my head at the grammar and wished I could of gone to the library! What an incredible end of the trilogy!!! Action, adventure, and romance are the trifecta of a fantastic story. All three were met and exceeded expectations! This last one was well worth the missing sleep! Vampire fanatics will adore this dark romance! Read full review in the 2018 September issue of InD'tale Magazine. This was a great book and a fun read. And I may just read it all over again! Loved it! All good things must come to an end. Sad to see that this wonderful series is over. The last story in the Dark Destinies series, Dark Child of Forever, follows Dominic's and Cassidy's adventure to the ultimate climax. S.K. Ryder brings vampires to a whole new level. Vampires are simply vampires, but in the Dark Destinies Dominic wants to unite vampires and convert them into beings of love, not hatred nor fear. This journey sees Dominic evolving from just a youngling vampire into the master of all. Of course his quest to see his dreams come true must come with road bumps. The biggest one called, Adilla. Quite honestly, a brat with anger issues. Dominic's and Cassidy's relationship grows. If you love getting the "feels" reading about characters, Dominic and Cassidy is the perfect example. Having read the first two stories in this trilogy, one can really get a feel about how much these too have grown. One being a vampire and the other human bring all of the expected problems, but this story actually focuses on it. I loved that Dominic wanted to give Cassidy a child, but obviously couldn't. (BTW--major tears with this story-NO SPOILERS). Secondary characters that I actually love now. One character that has truly evolved is Jackson. Hate for vampires was his major personality trait. But his growth was a major "aww" moment. He was actually cute. (You could not have gotten this response from me in book 1 and 2). I wished Serge got more play in this story. Totally underrepresented. He is the quirkiest vampire that I've ever read about and was totally happy to read his HEA as well. OMG this ending. Totally satisfying, but sad for me because it's the end. So glad that the author gave the reader what they wanted and still keeping the integrity of the story. S.K. Ryder is a software developer by day, a scribe by night and answers to Susan any time. She writes the type of stories she loves to read: heart-pounding adventures full of supernatural mysteries and relationships between strong, compelling characters. Though she calls South Florida home, she has also lived in Germany and Canada and has traveled widely, usually in the hot pursuit of wild and sc S.K. Ryder is a software developer by day, a scribe by night and answers to Susan any time. She writes the type of stories she loves to read: heart-pounding adventures full of supernatural mysteries and relationships between strong, compelling characters. Though she calls South Florida home, she has also lived in Germany and Canada and has traveled widely, usually in the hot pursuit of wild and scenic nature. When not debugging code, complicating her characters' lives or plotting her next rafting adventure down the Grand Canyon, she can be found beach combing, scuba diving, sailing or just hanging out with a good book and a cat. When push comes to shove, she can also bake a halfway decent cake and stand on her head, though not at the same time.